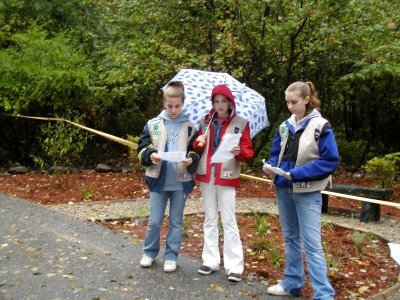 On Thursday, October 13, 2005, three Girl Scouts held a ribbon cutting ceremony at the second entrance off Prospect Street into Prospect Park. 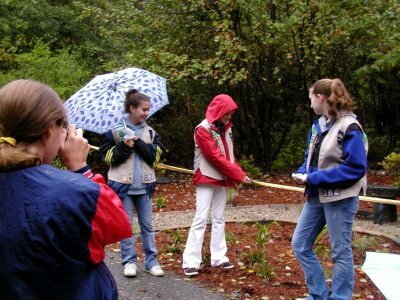 Becca Leach, Carolyn Tiernan and Katie Kalinowski earned the highest award, the Silver Award, in Girl Scouting for their work in developing this area. "Hello everybody, and welcome to the ribbon-cutting ceremony of the new Prospect park entrance. It was an honor and a privilege to work on the park, and we think that it came out great. 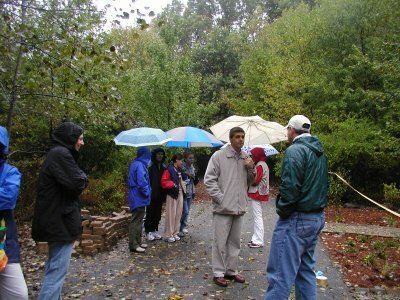 When we first saw the park entrance, it was just an overgrown paved trail. But now it's a beautiful area for all the community to enjoy, and we hope that you do. We wanted to do our Silver Award project here because we liked the idea of making a place that was once ugly and overgrown into a place that anyone in the community can use and enjoy. Once we got our project approved by the Town Council, we started asking for donations. A big thank you goes out to Rich Joseph of RJ Services (applause) Landscaping who cleared away the weeds and dead plants, donated and installed a stone bench, and helped us dig a gravel pathway. Another thank you goes out to Bigelow Nurseries (applause) who donated many of the plants that you see here today. Some of the plants they donated are daylilies, mountain laurels, and daffodil bulbs. Another thank you goes to Camosse Masonry (applause) who donated all the gravel and stone pavers. As you can see, the pathway came out great. A last thank you goes out to Shrewsbury Nurseries (applause) who donated all the mulch and some plants. And a special thank you goes out to Janet Hibson and Daniel (applause) for letting us use their water. After we got all these donations, we got straight to work on the park.